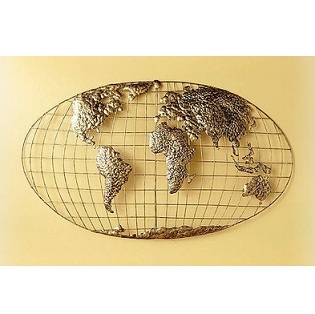 This city scene metal wall art sculpture is a great decorative feature for an artistic household. Metropolis I portrays an unnamed city and is a mixture of colours and metal textures shaped in the outlines of various buildings on would expect to see on a cityscape. One might recognise parts of your own city in this city themed wall sculpture or it might remind you of places you have been before. 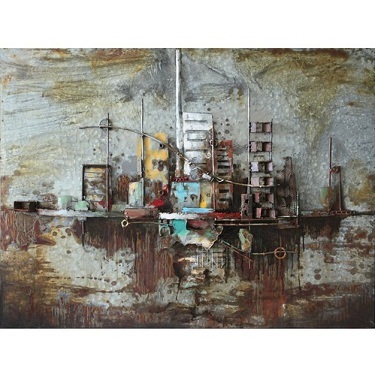 The rustic metal style is perfect for a depiction of a city. The city is actually next to a body of water, whether a lake, river or the sea. A boat or two can be seen floating in the water whilst the reflection of the buildings is cleverly mirrored in the surface of the water. The metal shapes can arouse various emotions depending on your memories and state of mind. There is happiness to be found in the joy of a big city whilst sadness of rusting lives can also be brought to the fore. 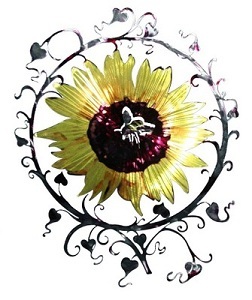 With such a transitional style art piece as this, one’s ideas of what the metal wall art piece means can change from day to day, and that is the magic of it. You can buy this piece from here: Metropolis I Wall Art. Painted on metal sheet with an inner wood frame. It’s primarily designed for outdoor use but this characterful winking sun sculpture will be equally suitable for an interior setting. As the winter months approach and the cold air begins to gnaw at our joints, it’s nice to have a reminder that the warm summer days will eventually return next year. What better way to do this than with a decorative sun sculpture that will enhance our moods and add an attractive visual element to a room. The sun can be smiling at us every hour of every day, whether there are rain clouds or not. 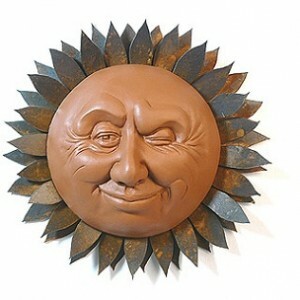 The winking sun sculpture is handmade in North Carolina and is made from a combination of steel and dyed concrete. The steel sun rays which act as a kind of frame have been given a rust finish for an added decorative effect. It’s not too heavy although it will need fixing to an indoor wall with more than just a regular nail you use for hanging picture frames. Alternatively it can be placed on an outdoor fence, wall or trellis. Indoors or outdoors, the materials will catch the light in different ways and add a shimmer to the scene. If you want to hang this winking sun wall sculpture indoors then you might consider placing it when a welcoming glint of fun and warmth are required. A hallway or kitchen are prime examples, as well as perhaps a bathroom, garage or workspace. It will also suit an area where a lot of natural sunlight seeps through and catches on the steel rays, thereby adding a shine. A sun room would also be a fantastic location for this charming sculpture. 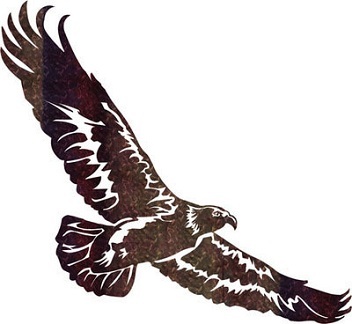 The eagle is the most iconic bird of prey and has been widely used in art and cultural symbolism for centuries. This flying eagle metal wall art sculpture continues this tradition and is an ideal addition for a wall inside or outside the home. The expressive and expansive wing span of the eagle sculpture insures that it will make an eye-catching and highly decorative feature in a living room or dining room, or alternatively on the exterior wall of the house or garden. Eagle species can be found in all continents of the world but are most frequent in Africa and Eurasia. In North America, there are just two species and these are the Golden Eagle and the Bald Eagle. The latter of which, I personally think, is the most striking in appearance. Probably the most familiar symbol of the eagle in North America is that seen in the Great Seal of the United States which features a bald eagle holding 13 arrows in one talon and an olive branch in the other. This symbolises the US desire for peace but its readiness for war if needed. The eagle is a majestic creature and is respected as a supreme hunter the world over. There is therefore little surprise this animal came to be the image for so many empires, nations, dynasties and movements. The metal wall art sculpture in the shape of an eagle soaring across the skies will thus bring a little historical background to your home and will especially compliment a patriotic household. Made from steel, powder coated and given a UV protective finish, the sculpture also comes in a variety of colors and effects. You can buy it from here: Flying Eagle Metal Wall Art Sculpture.